Joel Hanrahan left because of forearm tightness shortly after blowing a save in the ninth. Just hours after Bailey was placed on the 15-day disabled list, Hanrahan left Monday night’s game against Minnesota in the ninth inning after allowing a tying homer to Brian Dozier. Hanrahan has right forearm tightness and will have an MRI Tuesday. Hanrahan was on the disabled list last month with a hamstring injury and Bailey became the closer. After Hanrahan returned, Farrell said Bailey would remain in the role, but then Bailey developed inflammation in his right biceps, and Hanrahan resumed closer duties. Hanrahan couldn’t protect a 5-4 lead Monday. A few batters after Dozier’s homer, Hanrahan was removed. Hanrahan said he doesn’t know how to explain his injury because he said he felt good in the bullpen after two days off. The Sox could turn to either Junichi Tazawa or Koji Uehara to be the closer if Hanrahan misses time. The Sox have been trying to avoid overusing Uehara, who is 38. The burden may fall on Tazawa. This could also signal the return of Alfredo Aceves, who is working as a starter in Pawtucket. The Sox activated lefthander Craig Breslow, who started the season on the 15-day disabled list with left shoulder tendinitis. He made five rehab appearances at Portland (Double A) and Pawtucket and pitched a scoreless inning Monday night. Bailey underwent an MRI Monday and it showed no structural damage to the biceps or shoulder. Since Bailey hasn’t pitched since April 28, the DL move was backdated, meaning he’s eligible to be activated May 13. Bailey was disappointed about going on the disabled list, but not about the diagnosis. “One of my personal goals, I’ve told you a thousand times, was to stay healthy,” he said. “Obviously, a 15-day stint isn’t great, but it’s a little blip in the radar. In the interim, Bailey will focus on his conditioning. “Just shut it down, take care of the inflammation, do some work, extra work in the training room, just getting things moving properly,” said Bailey. Bailey said the MRI gave him peace of mind. “Obviously as a player, that part of the body is very delicate, but I know now that it’s just a strain,” he said. “It is what we thought it was and we’ll just go from there. Farrell said Breslow would be used in a variety of ways. “Not so much a specialist or a matchup,” Farrell said. “Obviously he’s had some success against lefthanders, but he’s also been a guy that takes almost a starter’s approach, shorter outings, and that’s what’s allowed him to be successful against righthanders as well. Tazawa entered Monday tied for first in the American League in holds (nine), relief wins (two), and appearances (16). He has held opponents to a .175 average over his last 13 appearances. Uehara hasn’t allowed a run in 12 of 15 appearances. With an eighth-inning double, David Ortiz extended his hitting streak Monday to 26 games, with the first 12 coming last season. Ortiz is still bothered by heel discomfort so the Red Sox want to monitor the situation closely and give Ortiz rest when needed. The streak has been a Catch-22 because Ortiz is getting on base and running a lot. It will be interesting to see how the Sox handle Ortiz when they begin playing interleague road games at the end of the month. Ortiz played first base in previous seasons, but with his heel issues and with Mike Napoli a fixture at first, Ortiz might get more time off. 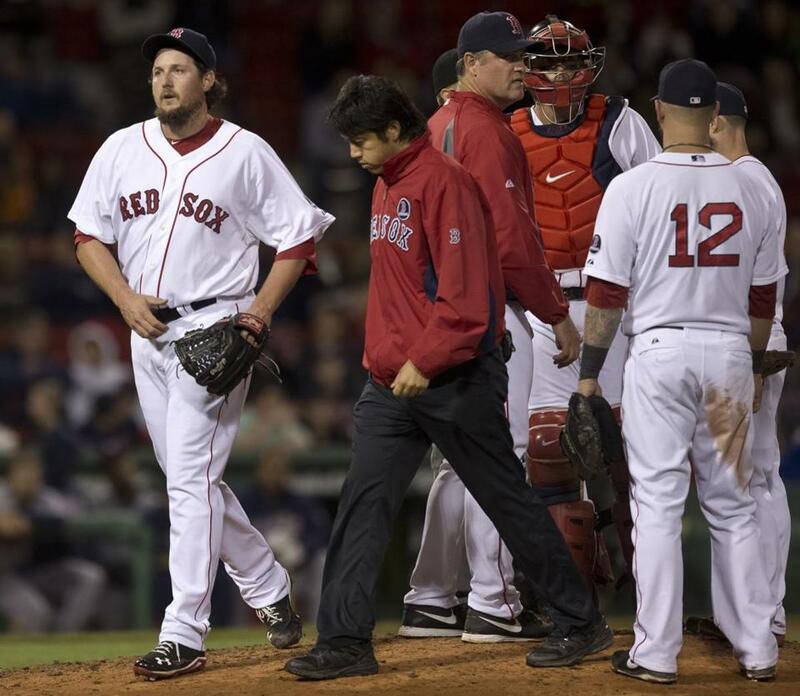 Ryan Dempster went to the bullpen to be the long man if Monday’s game had continued. While Dempster made some warm-up throws, Farrell said the righthander will still make his scheduled start on Tuesday night . . . Will Middlebrooks, who was 3 for 19 on the road trip and 1 for 7 in Texas, was back in the lineup after sitting Sunday but batted eighth. He finished 1 for 5. Shane Victorino also returned after not starting Sunday, batting second and playing right field. He hit his first home run of the season in the fourth inning and totaled three hits. The Sox are being careful with Victorino, who recently missed seven games with lower back tightness . . . After a three-hit night, Dustin Pedroia is hitting .350 at home.